Recession? What recession? When it comes early holiday shopping consumers rang up record sales as they snatched up Black Friday deals and seized on Cyber Monday bargains. Number crunchers estimate $1 billion was spent online Monday and $45 billion was spent at retail stores on Friday. The spending spree also reveal clues as to what this year's hottest technology gifts are. Think you know what they are? Read on for some early impressions from this year's Black Friday Weekend and Cyber Monday. 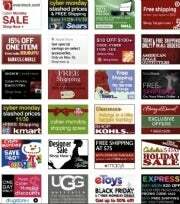 Cyber Monday sales could reach as high as $1 billion says Jefferies, an investment banking firm quoted by Reuters. According to IBM's Coremetrics tracking service Cyber Monday sales were up 20 percent compared to last year. Of course, Cyber Monday's numbers pale in comparison to the National Retail Federation projections for Black Friday sales. It estimates that American shoppers spent $45 billion in physical retail shops during Black Friday weekend from November 26 to Sunday, November 28. Online shopping grew by 44 percent on Black Friday 2010, but that growth didn't come at the expense of your local retailers, according to market research firm NPD Group. NPD says that so-called brick-and-mortar retail shopping grew by 6 percent in 2010 compared to the year previous. So while many Black Friday deals are now offered online, shoppers still can't resist the lure of lining up for all those 5 a.m. doorbuster deals at Best Buy, Wal-Mart, and Target. More people appear willing to shop online through their smartphone, according to Ebay's PayPal. The payment company recently said that it noticed mobile shopping increased by about 310 percent on Black Friday compared to 2009. PayPal handles approximately 16.5 percent of all online transactions in the U.S. The two hottest technology gift items this year are most likely going to be the Kinect, Microsoft's motion controller for the Xbox 360, and Apple's iPad. Microsoft announced late Monday that it has already sold 2.5 million Kinect devices since launching the motion controller 25 days ago on November 4. Apple hasn't announced any sales results from its Black Friday promotion that saw iPad prices cut by $41, but many critics have been looking to the iPad for months as a major holiday hit for 2010. If you missed out on the holiday shopping extravaganza, but are still looking for deals many retailers are continuing their holiday sales until Friday including Amazon, Best Buy and Walmart.